S. and Frederic A. Sharf, courtesy of the Flagler Museum. The Flagler Museum's fall 2015 exhibition With a Wink and a Nod: Cartoonists of the Gilded Age showcased rare original drawings made for the American humor magazine Puck, a pioneering publication that helped shape the character of American humor. Created by Austrian immigrant and cartoonist Joseph Keppler, Sr., Puck and its artists sought to bring about change through humor, attacking those guilty of corruption, greed, or vanity, and supporting the rights of the underdogs. Named after Shakespeare's mischievous sprite in A Midsummer Night's Dream, the magazine's masthead featured the character Puck and his famous observation, "What fools these mortals be!" A perfect manifestation of the magazine's editorial point of view, Puck was often depicted in cartoons pointing out the errors – or foolishness - of man's ways. Published initially as a German-language magazine in 1876, Puck's first English edition was printed in 1877 and continued to 1918. Puck was packed with lavish cartoons, color lithographs, and biting satire about everything from politics to fashion and domesticity. The magazine was the first to use full color lithographs in every issue, employing vivid color on the front cover, centerfold cartoon, and back cover. Puck's cartoons were often bold, graphic, and exaggerated, with content ranging from silly to sarcastic. Artists drew on common stereotypes like the hayseed and the new woman, and caricatured politicians, businessmen, and cultural leaders alike. No one was spared from ridicule, and the magazine's response to complaints was simply, "Can't you take a joke?" Puck helped develop American humor, from earlier tall–tales to the more urbane and literary humor associated with publications such as the New Yorker, by becoming a training ground for a generation of talented cartoonists. Many of the most important American illustrators of the period contributed work for publication in Puck. Original drawings in a variety of styles by artists such as Samuel Ehrhart, Louis Dalrymple, Louis Glackens, Franklin Howarth, Frederick Opper, and William Rogers are featured in the exhibition. Puck's editors encouraged experimentation and their artists pushed the limits of the art form. The long-running magazine remains a valuable resource for understanding how Americans viewed politics, religion, and other aspects of daily life during the Gilded Age. With a Wink and a Nod: Cartoonists of the Gilded Age examined the history of Puck and American humor through 72 original drawings created for the magazine from the collection of Jean S. and Frederic A. Sharf, supplemented with published cartoons and vintage issues of Puck. Organized by the Flagler Museum, With a Wink and a Nod ran from October 13, 2015, through January 3, 2016. An illustrated catalogue accompanied the exhibition. Please call (561) 655-2833 to R.s.v.p. 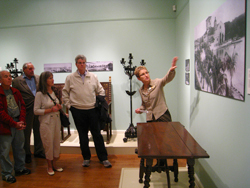 Join Flagler Museum Assistant Curator, Janel Trull, for a tour of the Fall Exhibition,With a Wink and a Nod: Cartoonists of the Gilded Age. Ms. Trull will guide visitors through a collection of cartoons drawn for the magazine Puck. In conjuntion with the fall exhibition, a hardcover catalogue has been produced by the Flagler Museum. 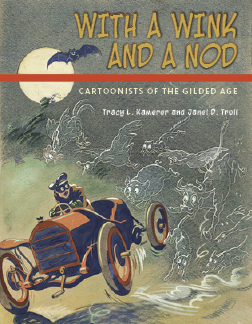 With a Wink and a Nod: Cartoonists of the Gilded Age, by Tracy L. Kamerer & Janel D. Trull, presents a "cartoonists-eye view" of America through the drawings made for Puck. The catalogue includes 64 illustrated pages of the bold cartoons and color lithographs that are included in the exhibition. Click here to purchase the catalogue online. A cartoon by Joseph Keppler, Jr. (American, 1872-1956), "1902 Finds the Helm in Safe Hands," published as the cover of Puck's January 1, 1902 issue, demonstrated support for Theodore Roosevelt after he ascended to the presidency following the assassination of President McKinley. Flagler Museum Archives. This visual pun by Samuel D. Ehrhart (American, 1862-1937), "An After-Dinner Speaker," was published in Puck, October 8, 1890, as part of the series "Puck's Illustrated Definitions." Collection of Jean S. and Frederic A. Sharf, courtesy of the Flagler Museum. "Fair Warning" by Samuel D. Ehrhart (American, 1862-1933), published in Puck, June 7, 1911, is a commentary on corruption among New York City policemen in the early 20th century. Collection of Jean S. and Frederic A. Sharf, courtesy of the Flagler Museum. Artist Louis Dalrymple (American, 1866-1905) tackled issues of modern womanhood and family in "Irony," published in Puck's Library "Jim-Cracks", April 1896. The cartoon depicts a man who marries to settle into a quiet family life, but ends up at home with the children while his wife is out every night fighting for women's rights. Collection of Jean S. and Frederic A. Sharf, courtesy of the Flagler Museum. An early Puck masthead designed by Joseph Keppler, Sr. (American, 1838-1894), featuring the character Puck and his famous observation, "What fools these mortals be!" Named after Shakespeare's mischievous sprite in A Midsummer Night's Dream, Puck was often depicted in the magazine's cartoons pointing out the errors – or foolishness - of man's ways. Flagler Museum Archives. A cartoon by Louis M. Glackens (American, 1866-1933), "The Boston Coffee Party," published in Puck, September 6, 1905, is a reaction to wasteful appropriations and Congress' recommendation that a tax on coffee be introduced as a way of increasing revenue. Collection of Jean S. and Frederic A. Sharf, courtesy of the Flagler Museum. Joseph Keppler, Sr. (Austrian-American, 1838-1894), a founder of Puck, created "Hurrah for the Red, White and Blue!" as the patriotic Fourth of July centerfold in World's Fair Puck, July 3, 1893, published at the World's Columbian Exposition in Chicago. Flagler Museum Archives. In "The Theatre Conversationalist," published in Puck, January 29, 1890, Samuel D. Ehrhart (American, 1862-1937) proposes a comical solution to a distraction that is still common today. The cartoon parodies high culture, fashion, and invention - topics common in Puck's pages. Collection of Jean S. and Frederic A. Sharf, courtesy of the Flagler Museum.